Love it or hate it, the F-35B is positioned to be–at least until a small combat-ready VSTOL UAV arrives–a critical piece of the Pacific Arsenal. It is no mistake that the start of F-35B sea trials and the launch of Japan’s large flat-topped destroyer Izumo (DDH-183) came the same week. The fate of the two platforms are undeniably entwined. These baby carriers also fuel China’s naval modernization. I mean, what would we do if the shoe was on the other foot? Imagine, just for a second, if we had no aircraft carriers and, say, Cuba, Venezuela, Mexico and Greenland were busy building flattops while, at the same time, growing increasingly friendly with a dominant naval power and building the framework for a regional containment-oriented security alliance? That’s simple–America would be building aircraft carriers as fast as we could. Laugh if you want, but that sort of thought exercise helps put China’s naval modernization into a certain perspective–which certainly may help us better manage China’s rapid naval growth over the years to come. There is a problem with the F-35B. It “might” be a good fighter. But the Western People don’t need it. China’s PLAN is hardly a threat. The Seventh Fleet, and our allies are a century ahead of Beijing, when it comes to the sea. The US Navy of fifty years ago dwarfs the 2014 PLAN (the Enterprise, 41 Nuclear subs, etc). Today, the F-18 Hornet, AEGIS – surface array, cruise missiles, and so on far outweigh the straits of Taiwan, Korean Penisula, and South Chinese Sea two hundred -to one – in “power projection.” The investment is better spent on advancements in the P-3 Orion (ASW) dredging new ports, and merchant hull designs. It also allows nations like Japan, S.Korea & Australia to involve themselves in areas like the South China Sea without directly basing fighters in nations like Philippines & Malaysia who militarily are at a disadvantage currently. While individually, these small flattops can only handle 12 to 18 fighters each, 6 – 8 of them can field more modern aircraft than both of the mentioned countries can field combined (modern or not). Australia 2, Japan 4, S.Korea 2, gives a total of 8, plus Thyland & potentially Singapore in the future. Its important to not look an individual ships potential, but the combined potential of multiple ships. 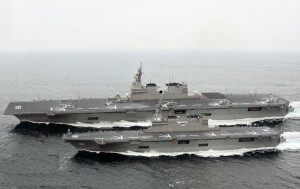 Assuming the Japanese DDHs will be used as a convoy escorts, the F-35s can play the same role (CAM) Catapult Armed Merchantmen played in the Battle of the Atlantic, shooting down hostile maritime patrol aircraft scouting for submarines and land-based bombers like the Xian H-6, attempting to attack the convoy. Where are you thinking? IIRC, Japanese territorial disputes with China are within fighter range of both parties. I don’t recall any ongoing Chinese/Australian disputes. IMHO the Izumo’s more important advancement for the JMSDF is its ability to act as a mini LPH, not as a CVL. Agreed, agreed. But there’s a lot going on in places where Japan’s (and China’s) land-based aircraft can’t reach (at least for very long). The lessons from the Falklands are still valid!!! If F-35Bs might give these tiny carriers “teeth”, they are baby teeth. A handful of STOVL fighters on a few small carriers shouldn’t impress anyone. Hyugas and Izumos don’t even have a ski jump. How much payload can they regularly get off these deck with? A few AAMs maybe? Just MHO, but land-based, Japanese fighters constitute a far greater capability in the context of China. Next post: Where will VT Halter’s Egyptian Fast Attack Craft Go?